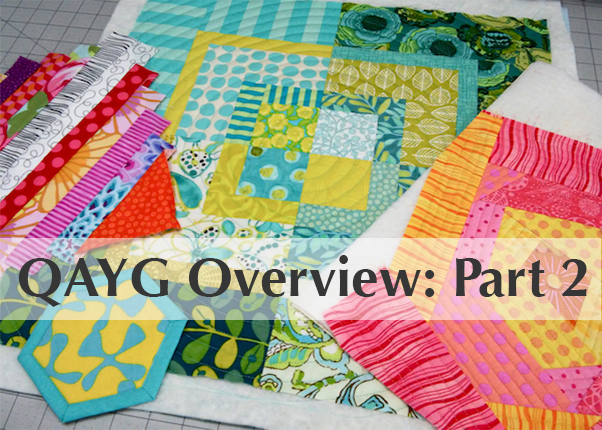 I'm back today with Part 2 of my Quilt-As-You-Go overview sharing the second of five methods I presented to the BoulderMQG at our September meeting. You can see Part 1 here if you missed it. Another way to QAYG is to make quilt blocks as you normally would and then, before sewing the blocks together, each block is quilted individually. Once the blocks are quilted, they are joined together to make the top. The top is then layered with the backing fabric and minimal quilting lines are added to hold the layers together. This also works well to join blocks made using the Stitch and Flip method I reviewed in Part 1. In the sample below, the string blocks were made using a Stitch and Flip method with strips of fabric sewn directly to the batting. The blocks were then sewn together as usual and the backing was added with minimal quilting along each seam line to secure all three layers together. The end result of this method is minimal, visible quilting on both the front and back because all you see is the straight lines along the major seams that secure the backing in place. 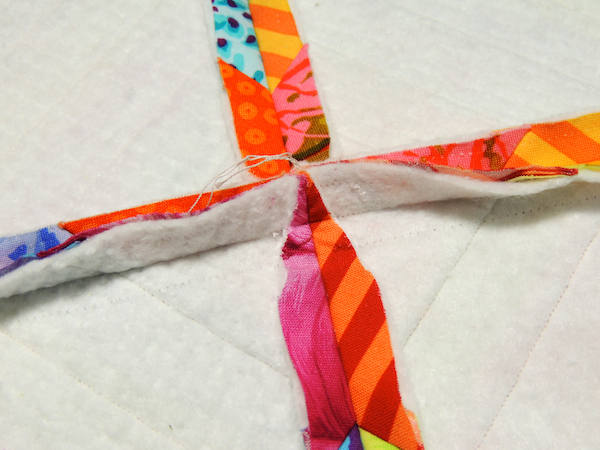 If you would like more quilting detail in the blocks, you can add it before the backing is attached. 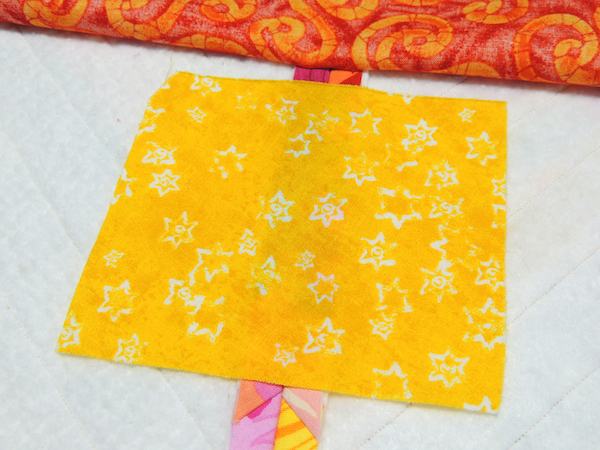 When sewing the quilted blocks together, it can be helpful to grade the ends of the seam allowance to reduce the bulk. Virtually any quilt could be done using this method but some are better suited than others. I would use caution with blocks that require a great deal of seam matching because the extra bulk of the batting can make matching the seams more of a challenge. Not impossible though. Good choices are string blocks or long sections of string piecing. Something to consider is that the seam allowances can show through your backing so choose the backing fabric carefully. You can see below how the seam creates a slightly darker shadow under the yellow fabric. Maureen Cracknell Handmade has a great tutorial for this QAYG method using strip piecing in long panels. She also just added a new tutorial for a braided quilt using the same basic QAYG method. 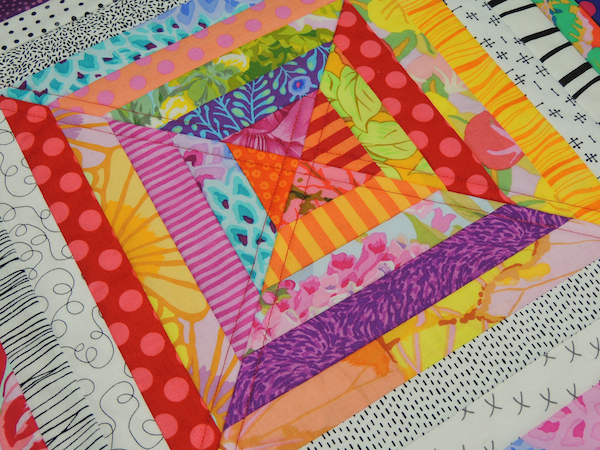 The block by block QAYG method also works well for quilts constructed from panels or sections. I used it for the quilt shown below which was constructed from panels. 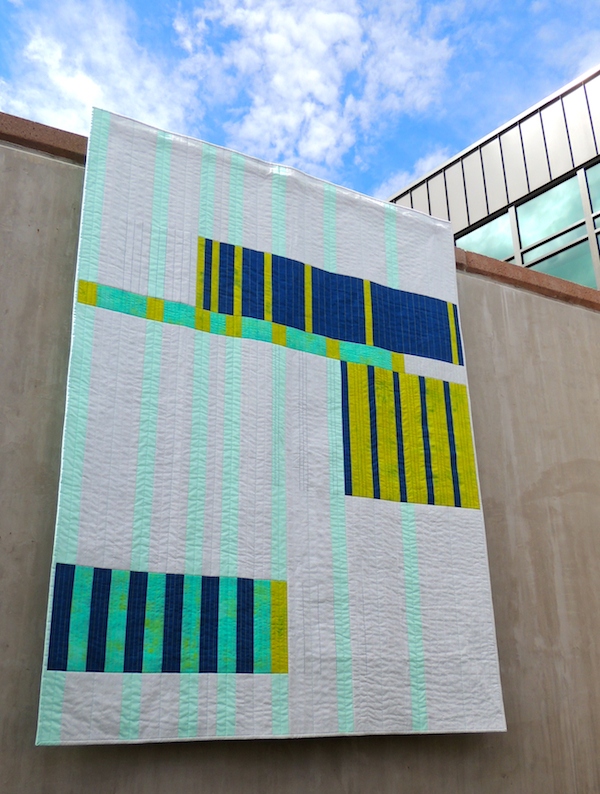 This quilt, called Rhythms and Reps, was the April Quilt of the Month featured by the Modern Quilt Guild. You can read more about it here. When I made this quilt, I hadn't planned to QAYG. It was a decision made after the the panels were sewn. There was a lot of seam matching and it worked out fine. In retrospect, there were a few things I would have done differently. I would have added even more quilting, used slightly wider seams for the panel joins so the seams would feel more secure and used a busier backing fabric. Due to the way this design was quilted, I didn't quilt along both sides of the major seam joins. Without this quilting, the bulk in the seams wasn't held down and created ridges on the back. Just something to keep in mind. Wider seams are more easily pressed flat and quilting along both sides of the seam helps keep the seam flat minimizing any ridges on the back. It’s a good way to use up small pieces or strips of batting. It can be harder to match seams on the front because of the extra bulk. The extra bulk from the batting in the seams can create ridges on the back. The seams can show through the backing fabric. The backing will be looser than the front since the quilting is less dense unless your blocks are smaller or additional quilting is added. Use low loft batting to decrease the bulk in the seams. I don't recommend poly batting due to the ironing that is required. Steam press the seams open to get them as flat as possible. Use a busy, darker print for the backing to minimize the ridges and show through from the seam allowances. Quilting along both sides of the seam will help hold the seam allowance flat and minimize ridges on the back. I'll be back tomorrow with Method 3: Block by Block with Joining Strips. In the meantime, check out my QAYG Pinterest board for pins of these and other tutorials on QAYG methods. I also have pinned quilts that I thought might work well with each method. Anne, this is an excellent post and it makes me want to try the method. Thanks for sharing! Love that quilt--and it's a good way to show us how to successfully use this method in a larger quilt (than just placemats, etc.). Thanks for this info.